As much as I love homemade ice cream, 9 times out of 10, I don’t have the patience to follow the recipe to the end. There always feels like more ingredients than I need (I think it’s the eggs for the custard base) and I always wait until I want ice cream to actually make ice cream (never satisfying). When I hit these situations, I turn to sorbet- a little less cook time which means faster turnaround to the table. Rinse the blackberries, then combine in a blender with the water and lemon juice. Purée until smooth, then press the mixture through a sieve to grab the seeds. In a saucepan, whisk together the blackberry juice and sugar. Bring to a boil and reduce to a simmer. Let cook for 1 to 2 minutes, until the sugar is fully dissolved. Remove from the heat, transfer to a container, and place in the refrigerator to chill completely. Freeze the sorbet mixture according to your ice cream maker’s directions, or, if not using an ice cream maker, place the mixture in a shallow pan and freeze. Once frozen, break into pieces and purée in a blender or food processor until creamy. This looks so amazing! I love sorbet! This looks amazing! I’ll definitely try this and replace the sugar with some Stevia and maple extract! Wow this sounds so easy – I’ve never tried to make ice-cream so I’ll start off with the sorbets! Absolutely gorgeous, Erin! 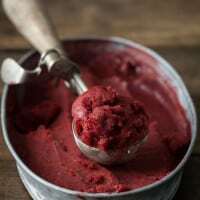 I love making sorbets in the summertime — the flavor combinations are incredible and nothing tastes as good as summer fruit! Looks so good. I like sorbet a lot, it’s so refreshing. This looks so delicious! Perfect for summer and I love sorbet so much! Absolutely stunning. There’s something about that rich + dark fruit color that makes my mouth water. This looks amazing. I will definitely try this. I haven’t made ice creams or sorbets so this will be my first venture. Great! Thank you for recipe! Thank you for your recipe, Erin. 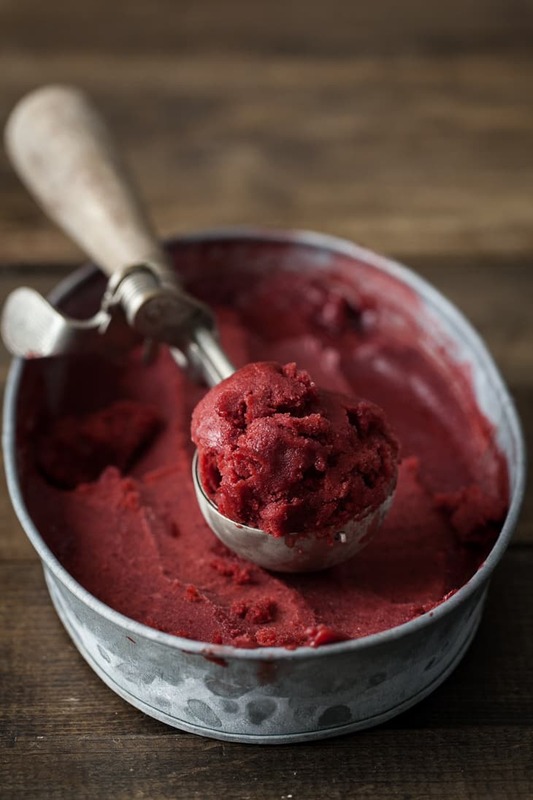 I like the idea of making a simple blackberry sorbet that has simple strait forward ingredients. It looks very easy to make. I will have to give this one a try. Oh wow this looks fantastic, I have been looking for a nutritious frozen desert for these warm evenings and I will definitely be having a go at making this. Thanks for sharing. .2 Replacing blackberries with apricot,strawberries, nectarins, peaches or raspberries will give good results? I don’t use artificial sweeteners, so I’m really not sure what the result would be. I think it would be okay, but you might want to change the amounts up. And Yes, but peel the stone fruit! Just went out into garden and picked fresh blackberries. I will be making this today for dessert this evening. Thank you! Found this yesterday and made it today with 1/3 c maple syrup instead of sugar – I have no ice cream maker, so the sugar would come out grainy. I can’t wait to try it tomorrow night with chocolate jimmies. As a kid, my fav dessert at Friendly’s was blackberry ice cream with tons of jimmies on top. Now I’ve got my non dairy fix, thanks! This is an incredible recipe! I didn’t follow precisely, but the gist of this recipe is spot on!!! I bought twelve 6oz packages of blackberries (FOR ONLY $00.88 per package – received over $37 back on the discounted blackberries!!!). Came home and made this sorbet and it’s entirely delightful!! Turned out FIVE quarts!!!! That was a lot of sieving, which was expected, and the receipt was EASY!!! Thank you so very much Erin! In never previously having made any sorbet, I will definitely use this recipe as a guideline for future sorbets!!! I’ve always loved sorbets as they contain zero fat, are delightful and refreshing. Thank you again, Erin!! !